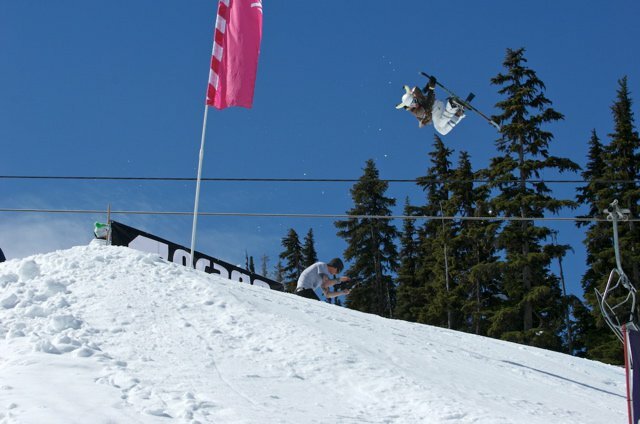 During a rare sunny day at the Telus World Ski &amp; Snowboard Festival in Whistler, the highly anticipated return of the 5th annual Orage Masters went off with a bang today and will likely be considered the most fun event of the season. 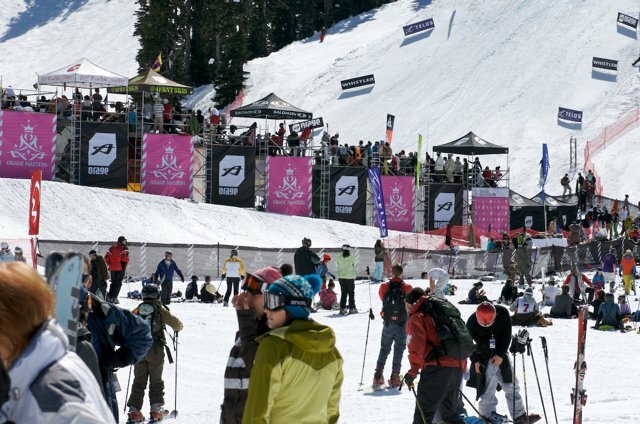 The Masters, also known as the &lsquo;Anti-Comp,&rsquo; pits eight teams of athletes representing their respective ski sponsors against eachother in a fun, laid-back environment where shredding the gnar is the name of the game. 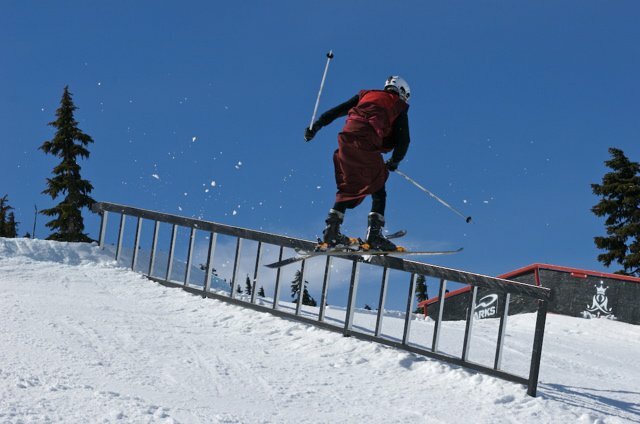 With the sun shining, a large crowd in attendance, an exciting slopestyle course designed by none other than the man, TJ Schiller, and each team dressed to the nine in themed costumes, the stage was set for an amazing day of skiing, shenanigans and all-around good times. 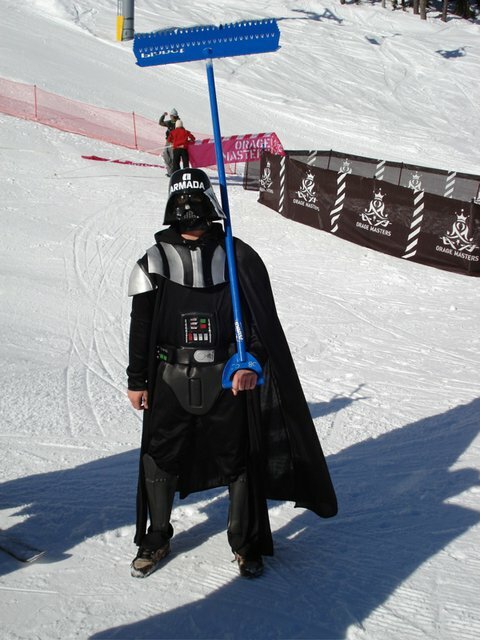 The teams participating in the event were Armada (who dressed up as Star Wars characters), K2 (biker gang), 4FRNT (Tibetan monks holding Olympic torches), Dynastar (Vikings), Salomon (superheroes), Rossignol (pirates), last second entry Surface (who scored themselves a spot in the event after two members of the Line team got injured, forcing them to pull out of the event) and the reigning Masters champions Volkl (David Hasselhoff). 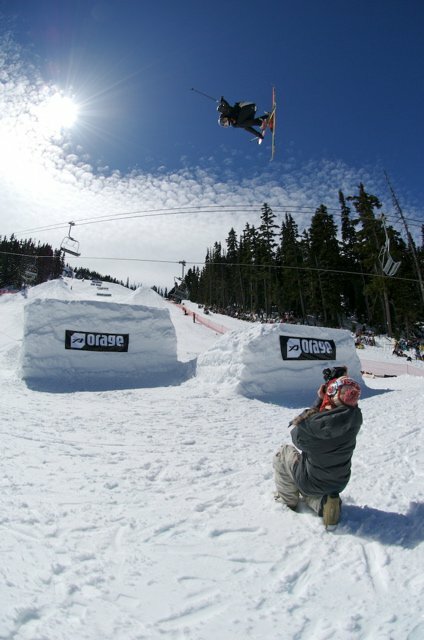 The unique format was round robin style, with two teams going head-to-head while the other six judged the action. In addition to the team-style judging, a small panel of judges (including JF Cusson, Joe Schuster, Mike Atkinson and Myles Ricketts) were on hand regulating the scores and contributing their own in case anyone tried to repeat the fiasco from the last Masters where one team gave certain other teams a score of zero for no reason. 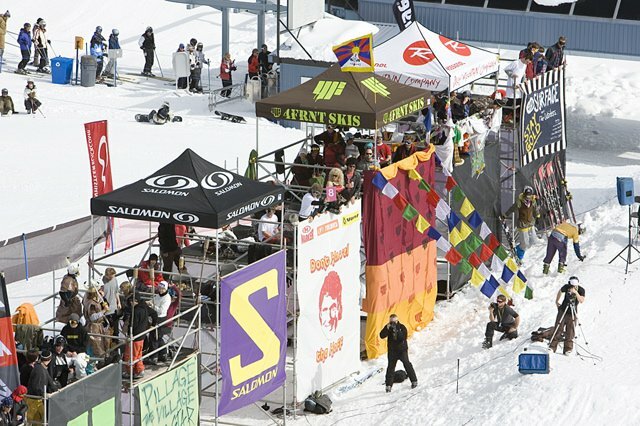 The first heat saw the Dynastar team of Justin Dorey, Mike Riddle, Banks Gilberti and Sarah Burke (who rides for Roxy, a sister company of Dynastar) go up against Salomon&rsquo;s Matt Walker, Bobby Brown, Mike Clarke and Erin Kerr. 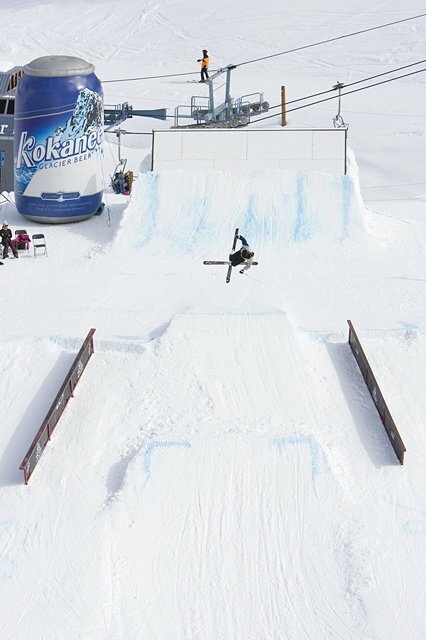 Unfortunately, Mike Clarke&rsquo;s seemingly endless stream of bad luck continued as he went too big on the final jump in practice and landed hard on his back, cracking his T7 disc in the process. Fortunately it will heal on its own over time so here&rsquo;s hoping for a speedy recovery for you Mike. 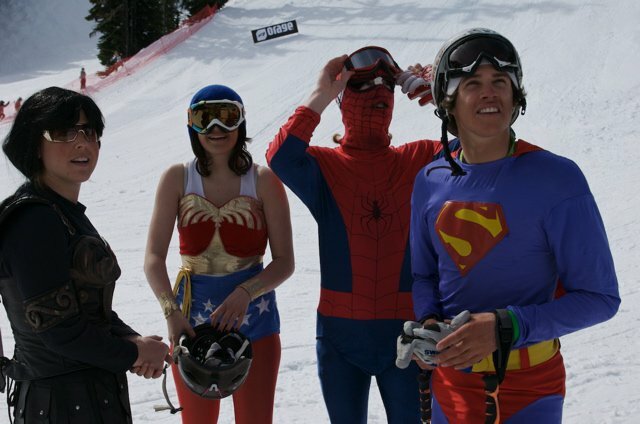 Although down a member, Walker (aka Spiderman), Brown (aka Superman) and Kerr (aka Wonder Women) more than made up for it with some smooth flatspins courtesy of Walker and what else but Superman front flips from Brown. However Dynastar was a force to be reckoned with from start to finish today and easily took Salomon down to move onto the second round. 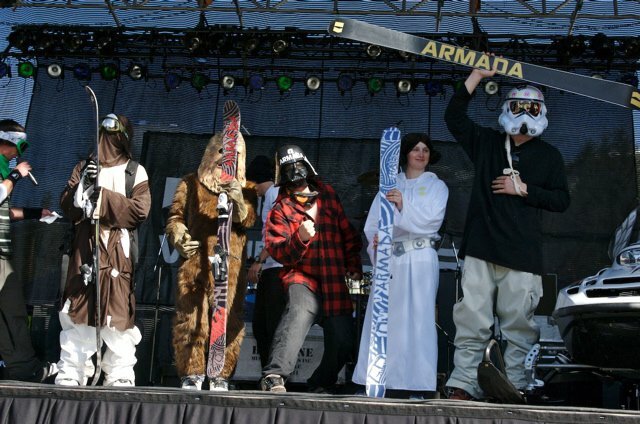 Next up was Armada vs Rossignol, with Cam Schuster (Chewbacca), Phil Casabon (Obi-Wan Kenobi), Sean Logan (Stormtrooper) and Kim Lamarre (Princess Leia) on board for Armada with their team captain TJ Schiller (Darth Vader) cheering them on, while JF Houle, John Spriggs, Austin Ross, and Rosalind Groenewoud were representing Rossi. 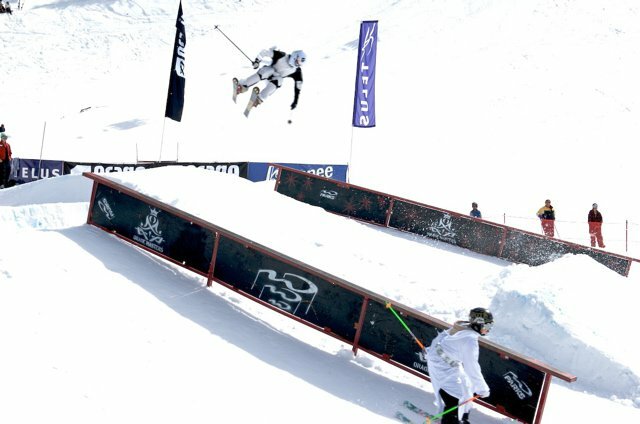 Armada had been skiing well all through practice and came ready to win this event and although Rossi skied like champs themselves, their momentum seemed a bit lost after another injury went down, this time to Roz, who took the bottom jump deep and took a hard knee to the face, smashing her face open in the process. 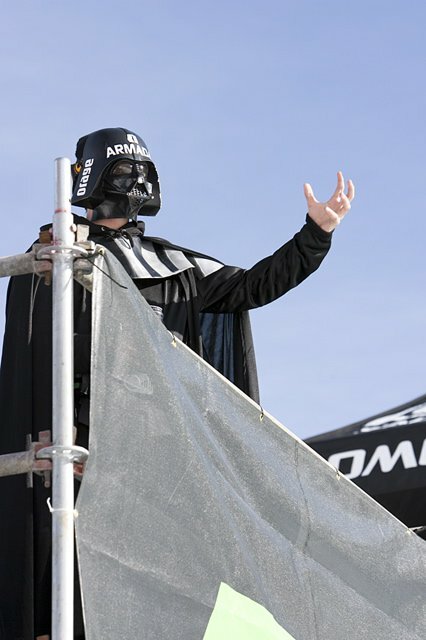 With Armada skiing their lightsabers out, they too easily moved onto the next round. 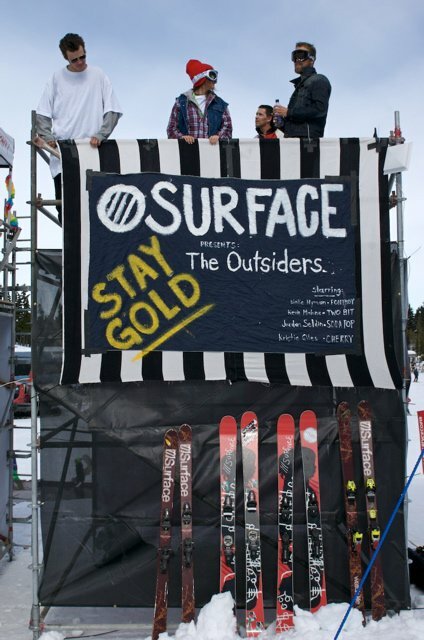 Next up was 4FRNT vs Surface in a battle of the independent ski companies in the closest contest so far. 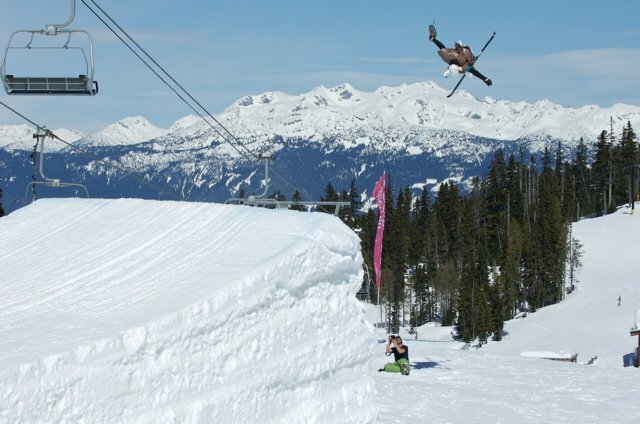 Surface, lead by Blake Nyman, came ready to play with some extremely stylish moves but 4FRNT&rsquo;s accomplished am team was skiing too strong and advanced onto the semi-finals. 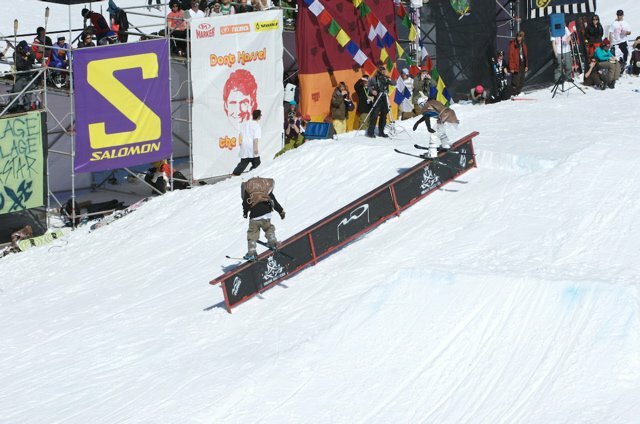 In the last heat K2 (aka the Spread Eagle biker gang) took on Volkl&rsquo;s Tim Russell, Craig Coker, Liam Downey and Ashley Battersby and both teams shredded so hard (including Coker using his skis as a rail for Russell to jib) that it was almost too close to call, with the difference in points from the judges being slim to none. 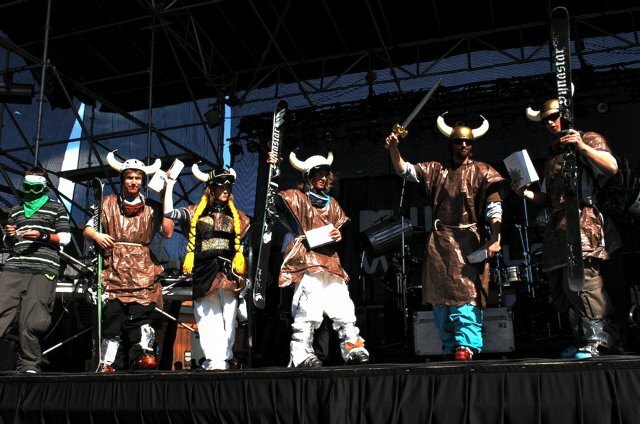 In the end though, K2, complete with their death metal soundtrack, moved onto the semis to take on 4FRNT. 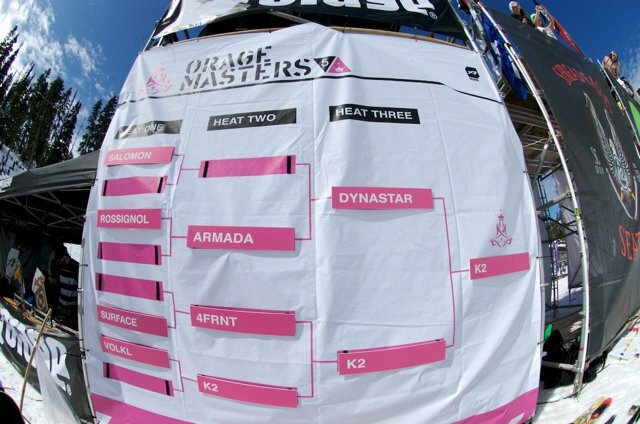 After a short break for some course maintenance the madness continued as the first set of semis went down with Armada going up against Dynastar. 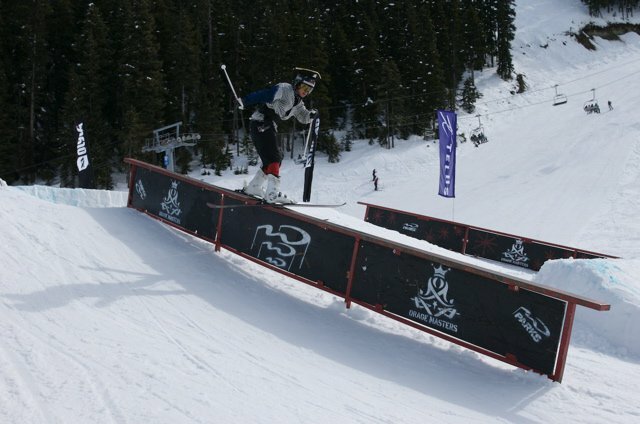 Both teams continued to kill it hard but Dynastar was the most on point thanks to some textbook styled-out spins from Banks and Riddle and some stellar rail skills from Dorey, helping the Vikings slash their way to finals while sending the Star Wars crew back to their distant planets. 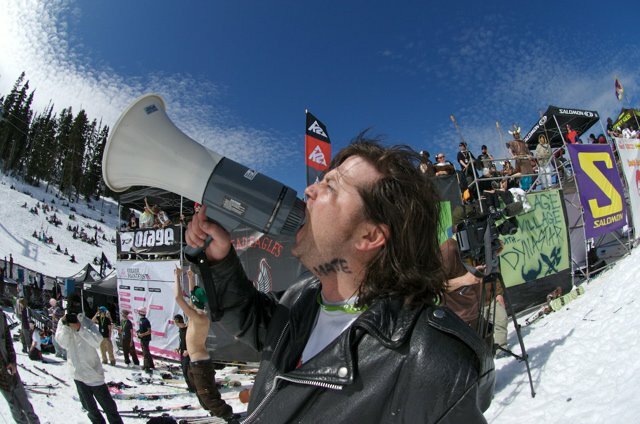 Following that it was K2 vs 4FRNT, and K2&rsquo;s momentum and stoke factor seemed to only get bigger, bigger and louder as the day went on, definitely in part to the encouragement they were receiving from the most badass team manager in the game, Mike Powell, who was screaming death metal through his megaphone and insisting his team shotgun beers and then smash the bottles at the end of each run. 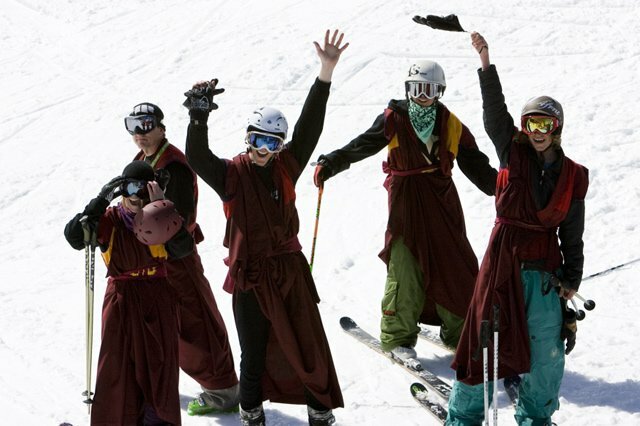 Their ferocity was no match for the peaceful Tibetan monks, and as a result, K2 was off to the finals as well. 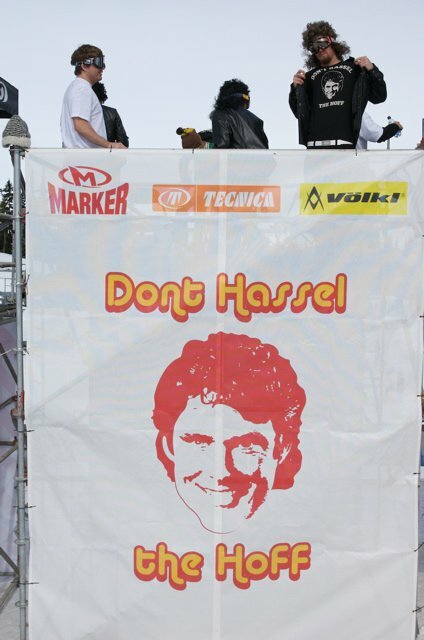 And then it was down to two. 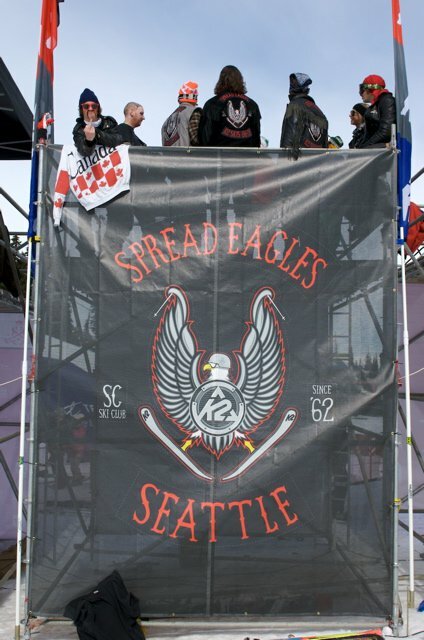 K2&rsquo;s Spread Eagle biker gang vs Dynastar&rsquo;s Vikings. 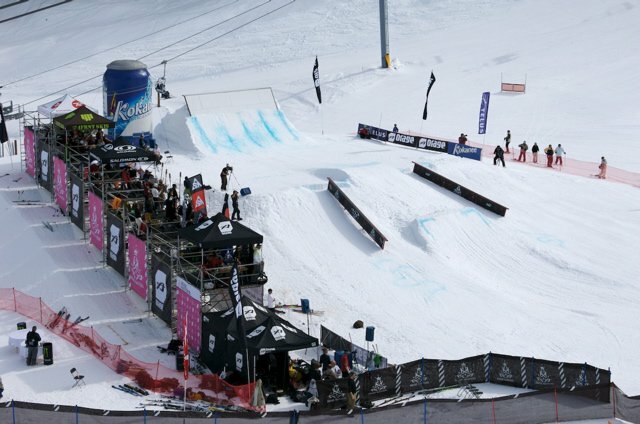 While in the previous rounds the teams had 15 minutes between the two of them to get as many runs in as they could, jam-style format, the finals saw them each have 15 to strut their stuff, making for some serious, serious shredding. 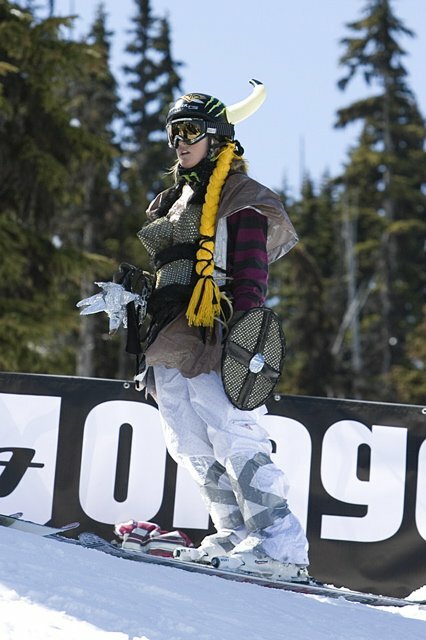 Dynastar went first and although they continued their reign of terror, they weren&rsquo;t as on point as in the previous heats. 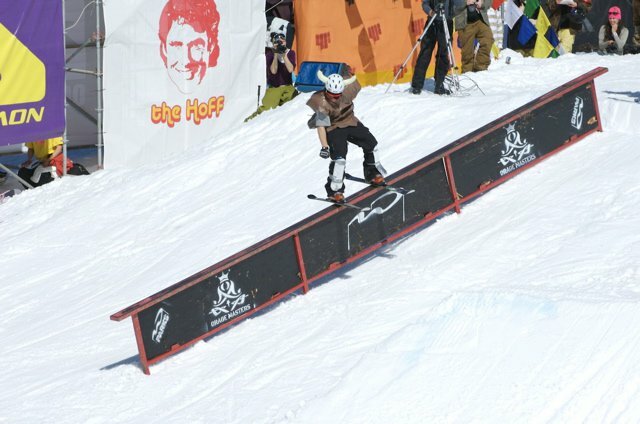 K2&rsquo;s team of Sean Pettit, Frank Raymond, Sean Decker and Anna Segal, with a few beers in them and more eyeliner than at a Motley Crue concert, took advantage, and proceeded to absolutely slay the course like no other team. 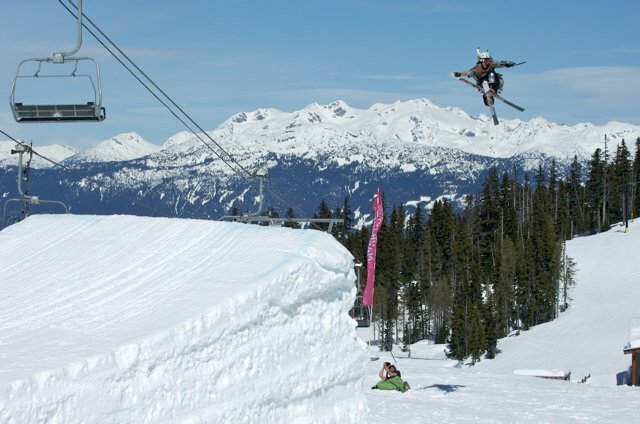 Raymond was throwing a different unique trick on the rails at the bottom each and every time, Decker and Pettit were owning the jumps with shifties galore, and Anna Segal stepped it up harder than any female all year with some big 7&rsquo;s and a sick rodeo 5 off the bottom hit. There was no question about it&hellip;today was K2&rsquo;s day. 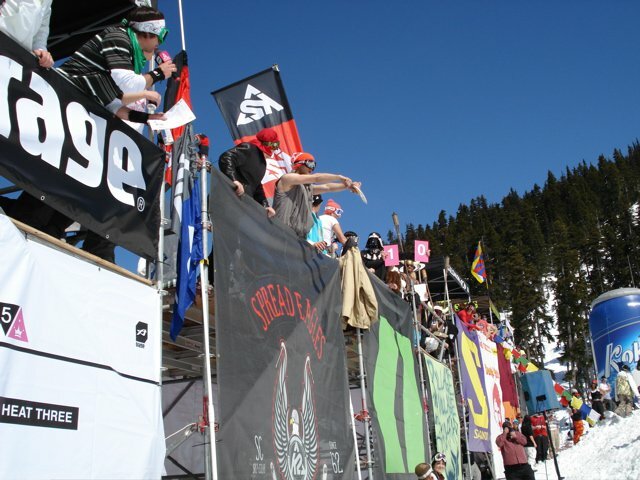 As the judges showed their scores, complete with 10&rsquo;s from most of the teams for K2, more beers were chugged, bottles were smashed and screams bellowed as K2 won the 5th annual Orage Masters. 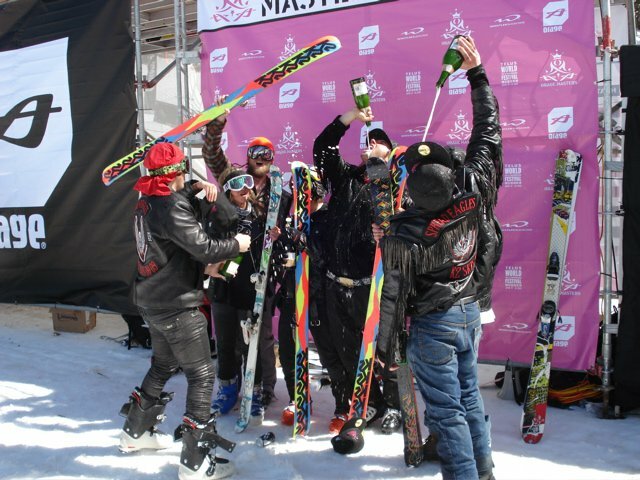 After a champagne ceremony on course, the teams made their way down to the bottom for the awards ceremony, complete with an awesome set of prizing that help make the Masters such a great comp. 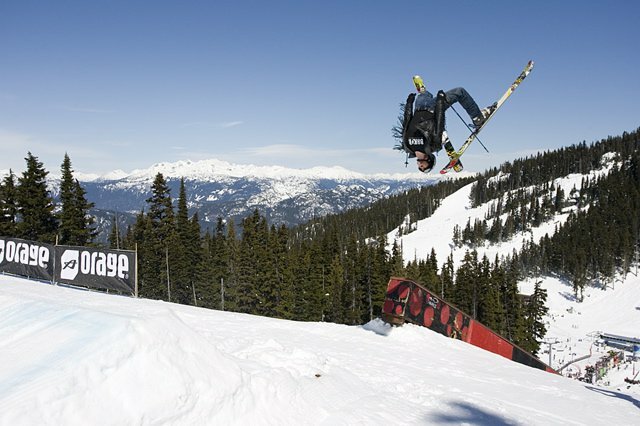 Third place finishers Armada were presented with Sirius satellite radios for their whips, second place Dynastar took home Telus cell phones with free plans and the champions of the day, K2, scored themselves two snowmobiles and two round-trip, all expenses paid trips to Jamaica at an all-inclusive resort. 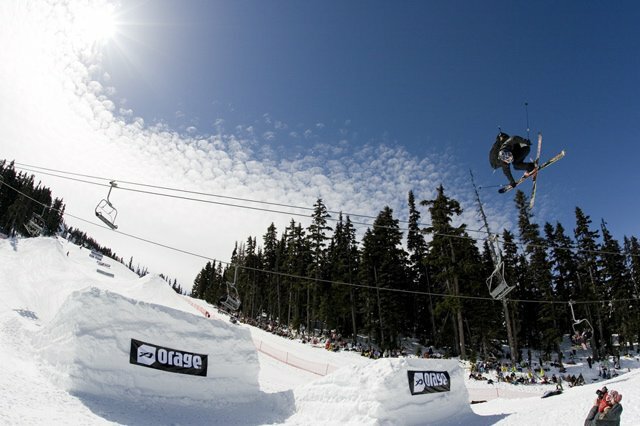 Big props to Orage for putting on such an amazing and fun event that was a more than excellent way to help end the competition season. With many of the athletes tired from competing and shooting all year and beginning to yearn for summer, today couldn&rsquo;t have been a more perfect and fun-filled day for everyone involved. For those of you that missed it, we had a full live broadcast of the event (save for a few internet problems) that will be available for viewage in its entirety beginning tomorrow right here and only here on NS.